Our mission is: "No Child or Senior without a Christmas". The application deadline for the 2018 holiday season was November 30. If you missed the application deadline, but need assistance, one of these local agencies may be able to help. 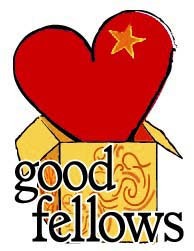 Applications for Holiday Assistance from the Goodfellows can be found here beginning in October, 2019. In an average holiday season, we expect to once again serve over 400 children, families and seniors in Farmington and Farmington Hills. Our all-volunteer efforts rely on the kindness and generosity of local residents and businesses to serve the most needy in our community in challenging times. We are always in need of canned or boxed non-perishable foods (expiration date 2020 or beyond), new books and new toys. Free movies at the Farmington Civic Theater on the first Saturday in December. During the downtown Farmington Holly Day Celebration on December 1, enjoy a free movie with the donation of a new toy, new book, non-perishable boxed/canned food items or a cash donation. Stop in at the Civic Theater from 10 am - 1 pm and support this worthy cause that helps your neighbors have a wonderful holiday season. There are two choices of movies for children, a full length feature with showtimes of 10 am & Noon and a short movie with showtimes 10:15 am, 11:15 am, 12:15 pm & 1:15 pm. Drop in and buy a snack from the consession stand (hot popcorn, pop, candy) and 50% of your purchase will also be donated to the Goodfellows. The Battle of the Middles XV Basketball Game featuring the teachers and administrators from FPS Middle Schools takes place on December 7th @ 5:45 pm at Harrison High School gymnasium. Check our website calendar for details, suggested donations and locations for each of these and other local Goodfellows events. 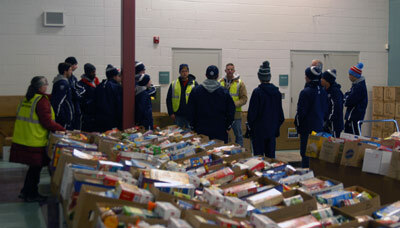 If you would like to volunteer to help out at our warehouse, or help us on the morning of Saturday December 22 for our "Delivery Day", please subscribe to the appropriate Farmington Area Goodfellows email list on the left or call us at the number above and we'll be in touch. Giving to the Goodfellows, whether in the form of food, toys, books, money or your time, is a wonderful way to help support those in need in our community. We hope you'll join us in our efforts to help others this holiday season.